What Causes Carpet Traffic Patterns? Carpet fibers are designed to reflect light, giving carpets a rich, luxurious appearance. When this reflective quality is obscured, carpets look dull and dirty. Dirt is the main cause of compromised fabric light reflection, not only because it accumulates and settles in carpeting, obstructing light reflection, but also because sharp dirt particles grind against carpet fibers and cause matting and abrasive damage. 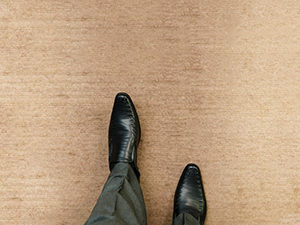 In fact, the illusion of dirty, soiled carpeting may persist even after the carpet is cleaned, because matting and abrasion are permanent carpet damage. You can dramatically reduce the amount of dirt your carpets are exposed to by placing door mats in entrances. Different materials for door mats, such as nylon, polyester, wool, rubber, or vinyl, offer different looks and benefits, but any door mat is better than none. Door mats help absorb moisture, dirt, and debris that would otherwise end up on your carpet. Regular vacuuming, even when carpets don’t look like they need to be vacuumed, will not only lift and rejuvenate the shape of carpet fibers, but it will also reduce the accumulation and settling of dry soils and dirt that causes carpet fibers to break down. further damage and refresh the appearance of your carpeting. This is one of a series of articles written and published on behalf of surpHaces Partners.